Anas is a space adventurer being in the wrong places at the wrong times. The universe is his playground and time is no limit to his travels. Join his adventure in spacetime and solve puzzles to make him survive this Sci Fi adventure. The game features 3 mini games, cameo appearances of other AGS games, original graphics and music, a song, 2D animated cut scenes and more. I found this game really tested my patience. It is one of those games,..very challenging,..which for me means very rewarding when you do sneak through (though I did have to use the hints and tips page). 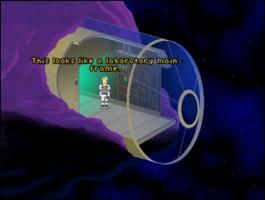 The reward is some great caroon cut scenes, pretty reminiscent to Space Quest 6. There are also some cameos, not sure what they allude to, and some close-up screenshots of characters. At first I was skeptical, specially with no demo available. But I was wrong, the graphics are great (you don't need my opinion just check out the screen shots and the trailer videos!) tons of animations and beautiful cartoon cut scenes. Music is VERY relevant and unique. Speech is -and I meant it- phenomenal. You just want to keep listening to the characters all the time. And for a bonus: a great great song that appears -spontaneously- just in the right time during game play! Very original. Felt as if Sierra created a game!